Following a strong opening to the first volume of The Syndicate Master Plan that effectively introduced new companion Ann Kelso and some of the nefarious powers that acted as an entry point to something altogether more sinister and dangerous, Phil Mulryne’s ‘Planet of the Drashigs’ unexpectedly offers a more standalone affair as the Doctor’s desire to show Ann an advanced alien world is thrown into disorder. Despite only featuring once in Doctor Who in 1973’s ‘Carnival of Monsters,’ the Drashigs have remained an enduring and endearing race among fans. These towering snake-like beings that can eat almost anything and withstand even heavy machine gun fire proved their power straightaway, and their relentless pursuit of their quarry once attaining a scent makes them a more instinctual rather than intellectual threat that presented the Doctor with a distinct threat where clever words were of no hope. Obviously, the audio medium does not allow that visual menace that still holds up well over forty years to later to feature, but their unsettling scream is equally iconic and allows their threat to transfer wholly effectively without sacrificing any of the requisite power of the beings. Sadly, the danger that the Drashigs present unwittingly provides them a certain allure to others, and in ‘Planet of the Drashigs’ these creatures are not simply one of many exhibits inside a miniscope but instead the feature attraction in an entire park devoted to them. With the wetland, desert albino, and deadly rain forest emerald species all featuring, this plan for captivity and display is fraught with danger, and the park is currently closed due to a visitor fatality with a Galactic Attractions Inspector on site to investigate the circumstances leading to this incident. Beyond the experimental research being done to allow others to experience just what being a Drashig driven solely by instinct truly is, it’s perhaps unsurprising that this is a story filled with homages to the Jurassic Park franchise, though unfortunately it is to the extent that vast portions of the story are wholly predictable with little surprise as a result. Of course, with any returning foe, the inevitable desire is to do something new with them rather than retread more of the same territory, and in this case that means giving the Drashigs a voice through a quirk that nobody could have predicted. While this doesn’t necessarily add anything to the Drashigs themselves and in some cases takes away from the predatory instinctiveness that made them so unique and powerful in the first place, the consequences are far more profound for the people around them who must react to the changing truths. Still, the imagery of a group of Drashigs using teleportation pods with the new information unknowingly afforded them is undeniably strong, and Jeremy Clyde as the naïve Lord Braye and Fenella Woolgar as the well-intentioned Vanessa Seaborne give strong supporting performances that bring the shifting reality to life incredibly well with at times conflicting emotions that help to develop these characters in a short space of time. Despite the very familiar stylings of the plot as a whole, however, the pacing never relents and the chemistry between Tom Baker and Jane Slavin remains a particular highlight. Ann is already unafraid of speaking her mind and even joking around with the Doctor, and though she shares some familiar character beats with several modern televised and audio companions, she provides a fascinating and bridging presence between the dichotomy that Leela and Romana continue to represent alongside the Fourth Doctor on audio. Though K9 is shunted to the sidelines a bit more than expected, spending a seemingly inordinate amount of time charging, the plight of the Drashigs and then of those around them allow Tom Baker to showcase an incredible range of emotion as well as the resourcefulness and determination of his Doctor, especially with the resolution that shows his more determined and even harsh practicality. 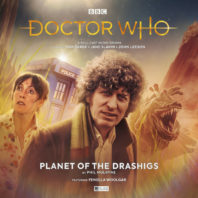 This is an enjoyable story with typical Big Finish polish and panache, but amidst the more unique ideas there are enough moments that don’t quite fully resonate that keep ‘The Planet of the Drashigs’ from standing out as much as the franchise from which it takes so much inspiration.